Your choice of domain name can affect how easy or difficult it is for you to build traffic. Ideally, you want something short(ish) and memorable. There are other criteria too and we’ll have a look at some of them below. First of all, what is a domain name and why do you need one? It’s your website’s address on the internet. It’s a case-insensitive string of letters, numbers, and a few other acceptable symbols, which enable people to more easily find and remember your website’s location. 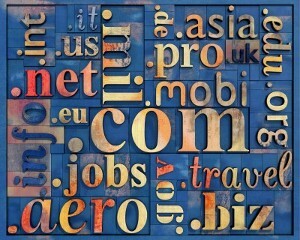 When talking about domains, you’ll often find a lot of jargon flying around. For example, “Do you think an EMD for [product] will perform better on the gTLD or on the ccTLD?” If you didn’t understand that, don’t worry. We’ll try to bust some of the jargon for you. As well as the name itself, eg kaymcmahon (case insensitive), there’s also the .com on the end. The .com is a TLD – a top level domain. The other most popular ones include .org and .net. There are also gTLDs – these are generic top level domains. These include .travel, .pro, etc. They don’t really seem to have caught on yet to the extent of the older ones. Lastly, there are ccTLDs – country code TLDs – which are very popular when you’re targeting traffic from a specific country, especially in the UK. There’s a lot more to be said about all that and, perhaps needless to say, several heated debates around the Internet as to whether one TLD is ‘better’ than another. It really depends on the purpose. But in simple terms, I would suggest buying the .com and possibly getting the relevant country domain, eg .co.uk to accompany it. There aren’t really any hard and fast rules. It’s possible to make money on a .co.uk site even if you don’t own the .com. There are many other TLDs, and more being released, but these are the main ones for now. These days it’s highly unlikely that you’ll be able to get the .com of your choice. Someone will already have registered it. Sometimes you need to be a bit imaginative – my old site at Kaystraffic.com where this article originally appeared, for example, was a result of my not being able to get the domain I wanted or even get close to it, so that was Plan B. You can also use lists of suffixes and prefixes to help give you ideas. And, by the way, an EMD is an exact match domain. It’s when the name you choose is an exact match for the specific search keywords you’ll be targeting with your website. Some people swear by doing keyword research and buying EMDs, while others say it’s a waste of time. Once you’ve got the ideas for your domain, next you’ll need to register it. This is pretty much like renting a house. You don’t buy it outright – you register it for a year or more. For that – surprise, surprise – you need a registrar. We have used several registrars in the past. Sometimes we’ve moved on because of poor service, for example from 123reg.co.uk, and we’d absolutely not recommend them. We’ve also used (and still do) several other of the big names, such as Moniker and GoDaddy. The reason we need several is because if you buy domains from other people, they usually ‘push’ the domain to your account with their existing registrar. It’s not absolutely necessary to have accounts with several registrars. It just makes things a lot easier to do so if you are in the after-market. For new registrations, ie when we’ve thought of a new name ourselves which no one has registered before, then for our .coms we always go to NameCheap these days. We highly recommend NameCheap as they’re, er, cheap. But they’re also very good too and to date we’ve never had any problems with them. So, if you’re absolutely bursting to buy a new domain, you can add to my beer fund by buying from my affiliate link above. If you don’t think I’m worth it, then just go direct to NameCheap. If you want to discuss domains in more detail then head over to the Experienced People forum and join in there. There are some more knowledgeable people over there. (Please note their rules before trying to post on the EP forum.) This blog post is only an attempt to give you a brief overview about domains in terms of how it might affect your traffic building efforts.